The Nihonzashi Store and Dojo is dedicated to supporting Japanese Swordsmanship. Our mission is to provide high quality low cost equipment and services to practitioners of Japanese Swordsmanship. The company was created to support the local students in the St Petersburg / Tampa area, but we hope we can help you find the right equipment for your needs. We have an extensive selection of shinken (live functional katana) and iaito (unsharpened or semi-sharp practice katana). If you are a serious practitioner of Japanese Swordsmanship or just love swords, this is the place you have been looking for. Nihonzashi LLC was formed by Mike and Sherry Femal. Both study Toyama Ryu Batto Do and understand what training equipment you may want or need. We are always looking for new swords that can live up to the rigors of the dojo and real use. Mike Femal studied Toyama ryu since 1994. He teaches Japanese Swordsmanship in the Konjaku Kioi Dojo in St. Petersburg, Florida. He has won 12 gold medals in competitions in both the United States and Japan and was the overall champion in the 2001 and 2003 Orlando Batto Jutsu Tai Kai. Sherry Femal has 25 years of business and accounting experience. She is dedicated to customer satisfaction. She has been involved with Toyama Ryu for many years and has been a student since 2004. 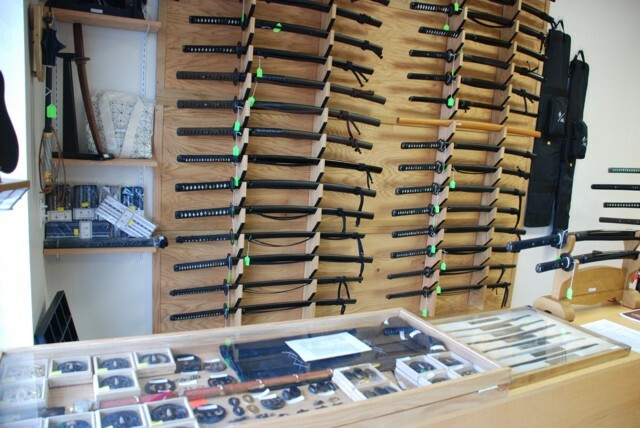 Nihonzashi Sword Shop and Dojo offers a unique place where you can come check out our huge selection of swords first hand. Every sword is different and we believe you need to personally find the right equipment for you. Let us know if you we can support you or your dojo.